By now most of you are aware that all four young falcons jumped from the nest box at Great Spirit Bluff on June 17th. They were approximately 10 days away from fledging. Searchers were only able to find one of four falcons. Bob evaluated Jonathon, a male, and decided to augment/foster Jonathon into another nest box rather than risk having him jump out again. He chose Red Wing Grain as the new site, since the two young falcons there are about the same age as Jonathon. We fostered Jonathon on the morning of June 19th and he seems to have adapted quite well to his new surroundings. We chose not to continue the search after the first night. Like many young animals, the falcons either hide or try to scurry under cover when they hear threats approaching. We didn't want to drive them so deep in into the undergrowth that Michelle and Travis couldn't reach them. Since then, we have heard the young falcons calling from the area below the nest box, and we have witnessed Michelle and Travis carrying what appears to be prey down below. We hope to see the young falcons at the nest box or on the ledge again, but only time will tell. We have received numerous questions regarding the nest box at Great Spirit Bluff. Is it a safe box? It is. In the Midwest alone, over 1,000 falcons have been produced at nest boxes that use this design, which provides shelter from the weather and perches for sitting. Netting under the boxes is out of the question, since the falcons would snag their talons, and holes or venting in the side of the boxes to let in wind would also let in rain and snow. Although we knew the gnats and black flies were bad, we were unable to intervene earlier, since that would most likely have caused the young falcons to jump before they had developed their flight feathers. In short, the risk of injury or death was higher if we went to the box than if we did not. This was an unusual and unfortunate situation. We haven't seen it before and we hope never to see it again. To view the Red Wing Falcons, click on this link, and then choose Red Wing Grain Falcons from the left side and click on that link: http://www.farmyou.com/falcon_cams/index.html. This cam may not always be available, since it has limited bandwidth. A big thank you to the Howe family for responding so quickly, climber Dan for last minute assistance, and the staff of Red Wing Grain for letting us foster a falcon into their box on very short notice. Bob made a difficult decision in a stressful situation, but he made it in the best interests of Jonathan, who is thriving in his new home. We have never seen or heard of a situation where three (eventually four) falcons that were 30 days of age or a little younger jumped out of the nest box absent any visible stimuli such as a threat approaching them. Bob said that we might expect to see 'branching' at 35 to 37+ days of age, but 30 days was too young. Something was wrong. His exact quote: "In all of my years of working with peregrine falcons I have never seen young falcons jump or slip off to their death. I have seen falcons nest on 1,000 foot cliffs on a ledge the size of a dinner plate and they always wait until they are feathered enough to fly. I am starting to wonder if we have a unusual hatch of parasites driving the falcons crazy. The only way a young falcon at this age could survive the fall is if by some chance it was slowed down hitting leaves or small limbs. Again, in all of my years of working with peregrine falcons this is new to me. We have had cameras on nesting falcons for twenty years and not witnessed this behavior." We've seen a lot of mortality this year at nest boxes. Of sites that hatched falcons, seven have experienced losses - a record for us. Per the quote, Bob theorized that insects and parasites might be causing problems following an unusually late and wet spring. This gave us a chance to save the falcons, if possible, and determine if parasitism or insects had played a role in driving the young falcons from the box. In short, GSBDweller let us know that young falcons were jumping from the box. Bob decided this unusual behavior needed to be investigated and headed for the bluff. George Howe, director of the Mississippi Valley Conservancy, quickly put together a search team and found another climber to help Bob, since it isn't a good idea for one person to be out on rope alone. George's team went up the bluff from the bottom, where they found falcon Jonathan. Bob's team waited on top, since the last young falcon was out on the perch. They didn't want to rappel and risk bumping it, since its flight feathers were too short for true flight. If the falcon fell, it might survive if it hit leaves or small branches on the way down. Or it might not. The team elected not to rappel unless the young falcon went back into the box. However, they were able to observe clouds of insects around the young falcon and adults, once they perched. The falcons were clearly bothered by the insects that swarmed them. Bob and Dan had pulled back from the bluff and were packing up when the last young falcon fell. Dan rappelled down to the end of his rope but was unable to find the young falcon. The talus slope is steep and covered in thick brush, and the young falcons would probably hunker down and remain quiet in the presence of human beings and other threats, making them very hard to find. The ground search is over, since at this point we would be more likely to do harm than good. We don't want to drive the young falcons from the top of the talus slope into the brambles, where Travis and Michelle would be unable to reach them. Jonathan was unharmed and should be kept in the wild if at all possible. 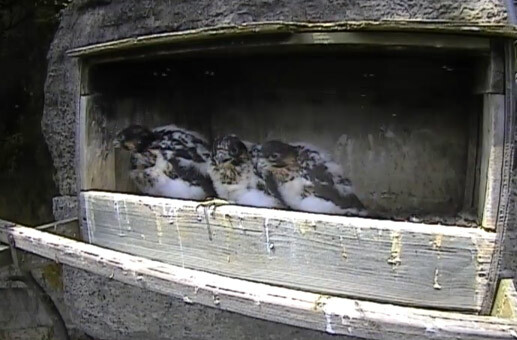 All four falcons abandoned the box due to flies or gnats. Even with treatment, the problem seemed likely to happen again. Since we haven't seen as severe a problem with the falcons at Red Wing, it seemed likely that fostering or augmenting Jonathan would give him the best chance at survival. 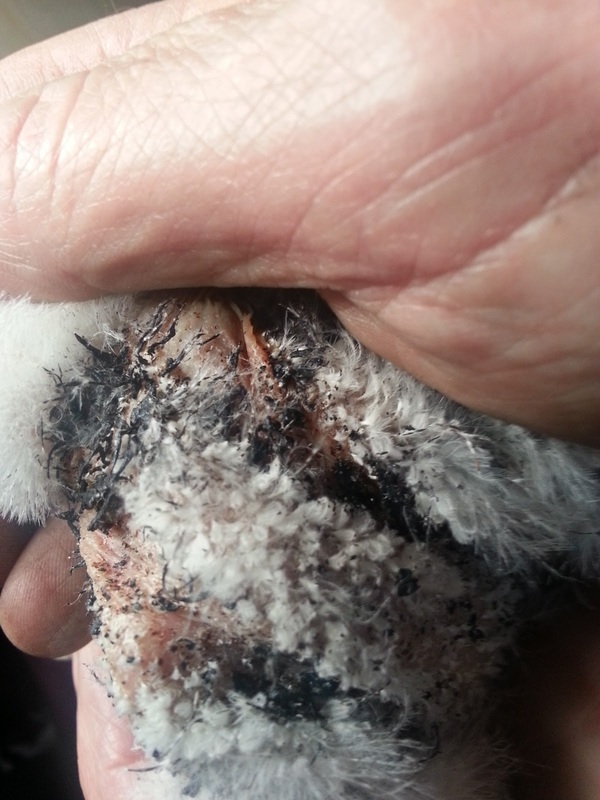 Fostering/augmenting is a proven technique that was commonly used in the early days of falcon recovery. Bob used augmentation a number of times in the early days of falcon recovery. Adult falcons don't count young, so as long as everyone is roughly the same age, augmentation can be used to introduce young falcons into the wild. Bob will most likely be fostering/augmenting Jonathan on Wednesday morning (he will keep Jonathan in his mews for a little observation prior to release). It seems likely that our pattern of disappearing and dying young falcons might be caused by insects and parasites in some combination - a "mega-hatch" caused by the late, wet spring. We'll let you know what we find out.